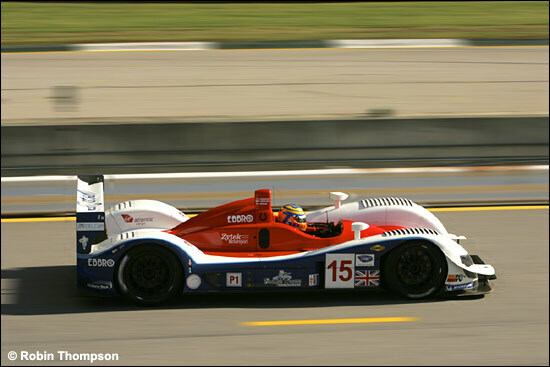 Having finished second at Petit Le Mans, with Stefan Johansson and Haruki Kurosawa, it’s no surprise to find that Johnny Mowlem will be racing the Zytek 06S again next week, in the final event of the ALMS, at Laguna Seca (with Johansson). Mowlem was a winner at Laguna Seca as long ago as 1999, in a Reiser Callas Porsche, with David Murry, and has three other podium finishes to his name there. Full preview next week: the significant changes to the entry list are the loss of the #20 Dyson Racing Lola and the Highcroft Lola, but the addition of the Bruichladdich Radical. In the other SR9, the van der Steur example, Adam Pecorari joins Gunnar van der Steur and Ben Devlin. Pecorari has been excelling in IMSA Lites this year.